600 pages | 95 Color Illus. As the economies of many countries become more interrelated, international managers are facing huge challenges and unique opportunities associated with their roles. 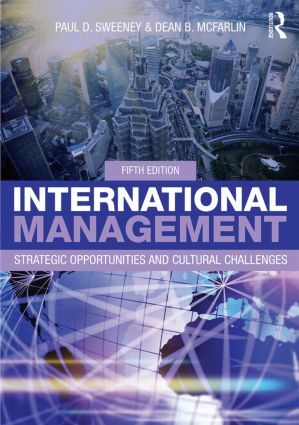 Now in its fifth edition, Sweeney and McFarlin's International Management embodies a balanced and integrated approach to the subject, emphasizing the strategic opportunities available to firms on a global playing field, as well as exploring the challenges of managing an international workforce. These principles are emphasized in the text with current examples and practical applications, establishing a foundation for students to apply their understanding in the current global business environment. With a companion website featuring an instructor’s manual, powerpoint slides, and a testbank, International Management, 5e is a superb resource for instructors and students of international management. Paul D. Sweeney is a Professor of Management and Associate Dean at the University of Dayton, USA. He is also a member of the Academy of Management (International & Organizational Behavior Division). Dean B. McFarlin is the Dean of the Palumbo-Donahue School of Business at Duquesne University, USA. He also serves as an Associate Editor for Academy of Management Perspectives and is a member of the editorial board for Journal of Management.